A comprehensive, authorized compendium of all things Buffy the Vampire Slayer,published in celebration of the revered show’s twentieth anniversary. From its debut in 1997, Buffy the Vampire Slayer became a cult hit with legions of devoted viewers and propelled the show’s creator Joss Whedon to stardom. Now, fans can discover Buffy’s world fully with this full-color A-to-Z encyclopedia that catalogs, explains, and cross-reference every detail of the Buffyverse, from characters, locations, and weapons to episodes, demons, and recurring gags. Packed with content from the television show, The Buffy the Vampire SlayerEncyclopedia is the first companion book that also includes key facts from the official canon comics and its spin-off show Angel—making this comprehensive volume the only truly complete guide to the entire Buffyverse. 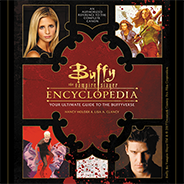 Lavishly produced and written by Buffy experts, The Buffy the Vampire Slayer Encyclopedia is the authoritative source for fans, allowing them to indulge in the intricacies and nuances of the series as never before. With color stills and photography throughout, an eerie cover with special effects, and an incredible design that reflects the show’s aesthetics, this fully authorized companion is a must-have for all Buffy enthusiasts. Buffy the Vampire Slayer TM & © 2017 Twentieth Century Fox Film Corporation. All rights reserved.